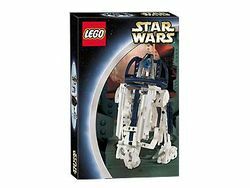 8009 Technic R2-D2 is a TECHNIC Star Wars set released in 2002. It includes 242 pieces to build R2-D2 out of TECHNIC pieces. The model has most of the main features of the famous character; the head can turn 360°, the middle foot can be extended and retracted, and there is an arm under one of the front panels which can be extended when the panel is opened. When the middle foot is folded away the unfolding mechanism is primed, so that when a button on the front of the model is pressed a rubber band will extend the foot, which simultaneously tilts the body forward into the position astromech droids adopt when moving. The arm can be extended and retracted from the back of the model, but the covering panel is not controlled in this way. All the feet contain moving wheels, allowing the model to move. There is an extra red element which can be swapped with the standard blue eye piece to replicate how R2-D2 looks when projecting a hologram. This set is included as part of the 65081 R2-D2 / C-3PO Droid Collectors Set. Facts about "8009 TECHNIC R2-D2"
This page was last edited on 9 January 2016, at 22:22.